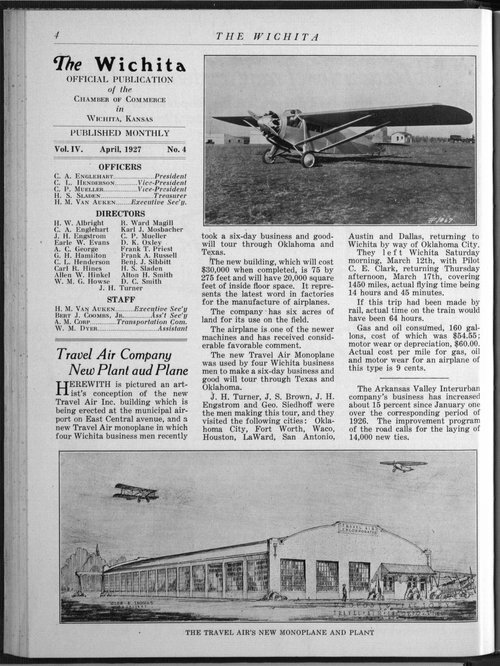 This article from The Wichita magazine covers the construction of a new airplane and a new airplane factory by the Travel Air company of Wichita. Travel Air was formed in 1924 by Lloyd Stearman, Walter Beech, and Clyde Cessna. Despite great success during the 1920s the company eventually closed its doors during the Great Depression due to dwindling aircraft orders. This article helps students see how far Kansas aviation companies had come by the late 1920s. In addition, the article gives students insight into the cost of building aircraft factories and maintaining airplanes during the period.